There were some interesting fun on Monday evening concerning a station on 1624 kHz. I noticed a carrier at around 2100 and was hooked straight away by a strong signal and then powerful modulation. After a while it became obvious that no identification was going to come as different records and different types of music were played, presumably to test the modulation. Observing the reactions of listeners in the pirate radio chatroom, some thought it might be Relmus, while others thought it might have been the powerhouse that is Calipso. Personally, I think it was Vuurvogel testing everything out before a programme in the coming days. Time will tell if I am right . . .
On Monday evening it was nearly 1800 before the first station came through. 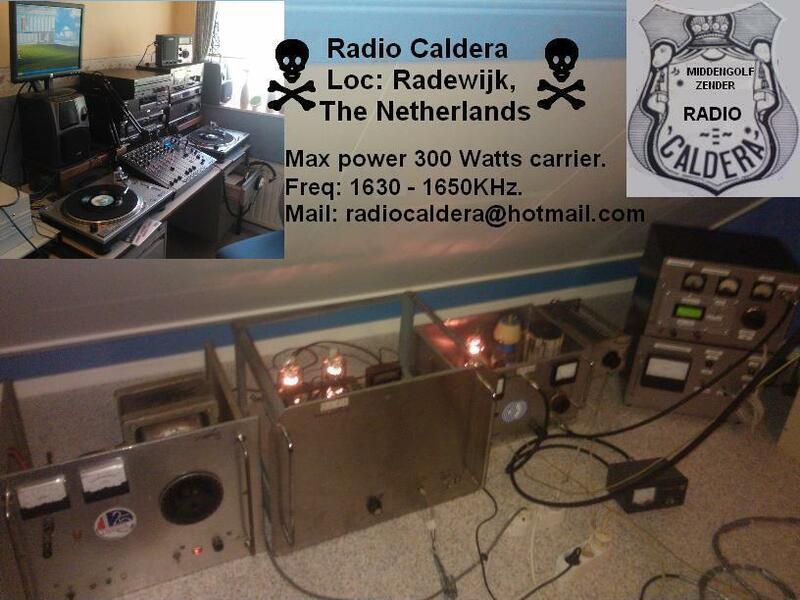 When I came back to the radio a few hours later, Caldera was doing well with 300 watts on 1640, testing his modulation. The voice sounded particularly good. Armada was putting in a power-packed signal on 1647 and when he closed down both Casablanca and Pandora were very strong. I have a couple of old Sony tuners here and I thought I would try one of them out on MW tonight. I had made no adjustments so I did not even know if it would be possible to receive signals above 1611 khz. So, I connected up the MW coil antenna, currently standing at around ten metres high, and then had a tune to see what I could hear. Straightaway there were Dutch pirates coming out of the speakers and in very nice quality. Pandora sounded particularly good and was lighting up several of the five green LEDs on the receiver. Have a look here . . . It's the early hours of Friday morning as I write these words. I've had a busy couple of days at work without the chance for much radio action, although I was listening to Casablanca and Jeneverstoker qsoing a little while ago and I'm now tuned to a solid signal from Radio North on 846. 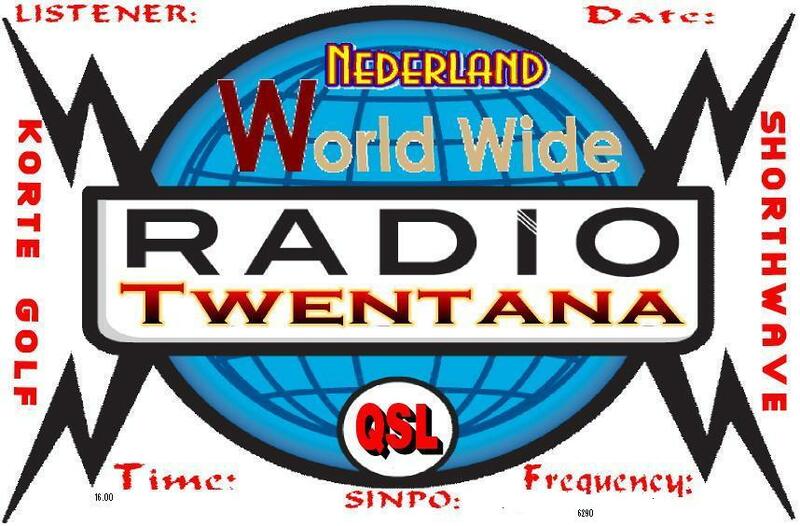 Monday and Tuesday evenings were busy on the Dutch pirate band, with plenty of activity between 1611 and 1700 kHz. 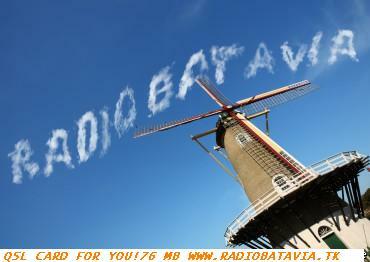 And on Sunday evening there was a long and enjoyable broadcast from Radio Utopia on 1620. He was testing out a different modulation system and coming in very well here. I made a small video as he closed down . . .
And here are the stations heard since my last blog entry. I've been using the Kenwood R5000 with the outdoor loop antenna for the last week or so . . .
Bontekoe was testing late on Tuesday night and was coming through with a fair signal on 1669. 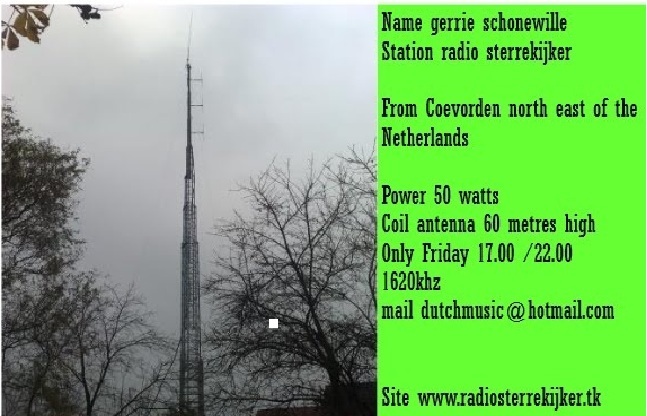 There was a station with this name many years ago, but I think this is a different one - the cow noises heard on the frequency suggest this station is also active on SW as some listeners might recognise! With the clocks going forward soon, reception during the early evening will become more tricky here in England, so it was good to take advantage of some great conditions on Monday when stations started coming through at around 1730. The best signal belonged to Pontiac who, just like the last time we heard him, was hitting the maximum 55555. A little later there was also a very strong signal from a station playing non-stop music on 1620. He was on air for around an hour. If I had been in a long, deep sleep and woken up today I might have been mistaken for thinking it was Christmas again. It was -3 degrees here on Monday morning with a windchill of -7. During the afternoon it was snowing. And during the evening Radio Bluebird was playing festive music on 1647 kHz - among others we heard the Merry Christmas Polka! On Sunday night I went to bed at around 2230 thinking I would have a good sleep. However, with my wife fast asleep I could not resist the temptation of switching on an old radio sitting next to the bed. It tunes up only to around 1650 kHz, but with the small indoor loop there were some good signals to listen to. I heard Utopia, Jack Sparrow, Babylona, Noordzee, Monte Carlo, Arrianne and Veronica. I even made a few recordings using my mobile phone. Click here to take a listen. It is a good job Lisa is a heavy sleeper! For the last few evenings I've been tuning in to the MW pirates quite late, but there has still been plenty to hear. In the space of one hour on Thursday evening I heard nine different stations. Seven of them were qsoing and two were busy with programmes. I know some people who are not keen on endless chatting on the band and much prefer to listen to music and talking. I don't mind either type of broadcast - sometimes I like to leave the dial on one station and listen to lots of music, especially if the signal is strong and modulation is good - and at other times it can be fascinating to compare signals of stations qsoing with each other. 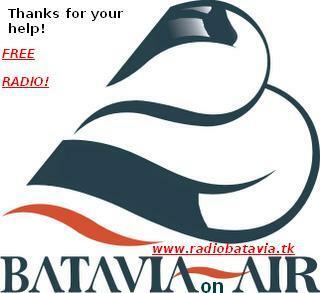 At around 1930 on Saturday evening I had a WhatsApp message from the team at Matrix Radio, who have joined forces with Batavier this weekend. They were asking if I was near my radio, but I was at work. However, when I arrived home at around midnight they were still going strong and I have been enjoying listening to them on 1670 kHz with a fine signal on the old Pye radio. It was great to hear these two stations on air together as it is four months ago to this day that they were in England, together with Radio Barones, celebrating our wedding. Great times. I made a couple of short videos of reception here this evening . . .
Good day from England! I am happy to report Friday night has been a good one for listening to the Dutch pirates, with plenty of activity and good signals. Here is what I've heard . . .
1656 2222 Noordzee at same time as Calipso!